With the exception of running a sub 20 – 5km race (which I have come close to) I have pretty much achieved the other two goals. Above all one of the most important goals that I set myself this year was to build a consistent high mileage base and avoiding getting injured. With my somewhat high mileage training leading up to the June marathon I was able to get to about 80kms per week on average with couple of weeks of 100kms of running. As I indicated previously after (re)starting my running back in 2011, I have been able to steadily build up my base. This has not been easy, however the perseverance has paid off as now it’s showing the benefits of me being able to do good consistent workouts weekly. The best indication of this is my recovery times from hard workouts such as Tempo runs and Intervals are much faster than before. Since I gather data from my runs I can use this to compare same types of runs from a few years and months ago to now and see the relative improvements. Looking at this information is one of the best motivators that I use to focus on my next goal(s). On Sunday 4th August I am going to run a half marathon in Taupo. This is not a key race but rather a trial race to see if I have had any improvements, hopefully be able to beat my time 1:37 of the same course from last year. Over the last 5 weeks my plan has been to build up core/leg strength and also up my mileage again so I can get to an average week of 100kms and a peak of 120kms in the next 6 weeks before the Abel Tasman trail race. I haven’t picked any other events for this year after September. 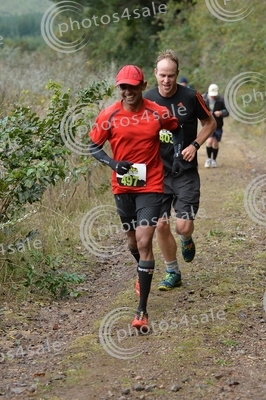 The next main goal is Rotorua Full Marathon in May 2014. I will probably do a few half marathons leading up to Rotorua as well. This is what my current training log looks like. The dips in Feb and June indicate events. Now I’m on a build up phase again. Do you log your running? What does your log look like? How much do you run weekly? Last Friday (12th April) I left NZ for a work trip to London. This was a very short trip (5 actual days in London) and I made sure that I packed my Running gear with me. Just before heading off on the trip I found out via @leahevansnz on Twitter about the Energizer Night Run which was being held on the Saturday night (13th) in London’s Battersea Park. Basically meant after a 32hours of traveling door to door from Wellington, NZ and within 6 hours of me arriving in London I had a 10km race scheduled! Nothing like an all out run to cure jet lag! The International flight from Auckland to London via LAX was without any dramas but I was not able to sleep much on both legs. Arrived in London around 2pm local time on Saturday and checked into my hotel near Buckingham Gate near Victoria. Pretty close to the Conference venue where I was attending a conference and speaking at. (I won’t bore you all with my work stuff) So anyways I was feeling pretty tired by the time I got into my room and after a quick shower I decided to have a nap and set my alarm to 6:00pm. I was out for the count! If not for the alarm I would have just slept through. Getting up a little dazed I had to kind of remember where I was and that I had to go run 10k! 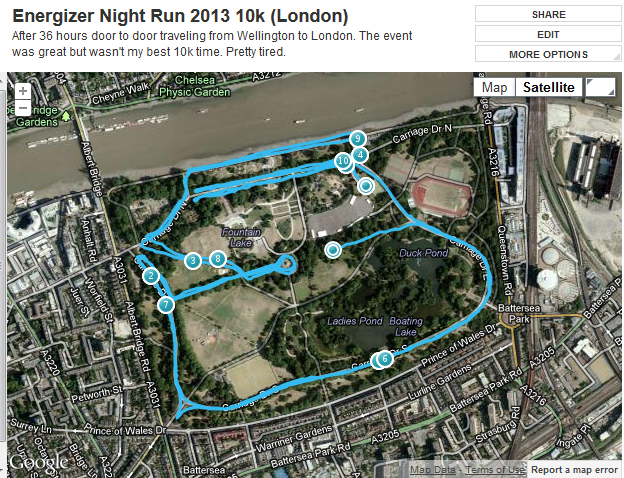 The event start was at 8:30pm and Battersea Park was about 3kms from where I was. Looked at the weather and it was drizzling with rain and was pretty cold out. I put on my gear and headed out around 7ish. I was feeling pretty tired but a couple of cups of coffee before kind of made it OK. (not my usual choice before a race but I knew I wasn’t not in any way going to run a PB). Took a Taxi to the venue since I didn’t want to try and find my way there and get lost. The event HQ was inside a great hall where I picked up my registration pack. There was a whole lot of people already there and they had a very efficient team to get your registration pack quickly. The registration pack contained the racing number bib with some electronic timing thingy already attached to it, safety pins, a T-Shirt, an arm wrist band to gain entry the “after party” and an Energizer LED head lamp! Afterwards you could head into the main hall where all runners were gathering. This was a big hall with a bar and some food stalls as well a DJ! Loads of people were in there getting ready to run! I met up with @leahevansnz at one of the stalls and said a quick hello! Great to see a whole bunch of other Kiwis joining in the run as well. On the main stage inside the hall the crowd was greeted by Nicola Adams (Gold at Boxing in London 2012). I headed outside the hall and it was pretty much raining at this time. So it was going to be wet and cold – hmm why did I sign up for this again? Well anyways I made myself to the start so I could get into a reasonable position. The only comment I have about the start was that they started all the runners in one go. Meaning 5km and 10km runners were all together so it was hard to gauge who was racing who. Anyways we were waved off by Nicole Adams and the race began. The first Km was pretty easy and although I was tired the feeling of all other runners around me got me into a good rhythm. Since this was in a park it was somewhat of a loop course where the 10k runners did two loops of the course with some sharp turns inside the park. I passed 5k around 21mins and then ran the last 5k slightly slower and resulting in a final time of 43min:13secs. Not my fastest but not bad after traveling 36hrs. The event was a lot of fun and well organized. Check out some of the photos on the Energizer Night Run UK facebook page. After the run each runner was given a medal! I was pretty cold and tired by the end. So got back to my hotel pretty quick without waiting for the “after-party” and was asleep before I knew it! On Monday afternoon I heard the news of what happened at the Boston Marathon. I was immediately concerned about a couple of runners from our Wellington Scottish Athletics club who was running in Boston. (They are safe as they finished before the explosions!) It angered me on many levels like so many others in the running community. I’m not going to write a whole post about it – suffice to say that I was thinking of everyone who are affected by senseless acts like this all over the world and not just Boston. My Tuesday run was special because I felt that whatever the odds we can still keep going. Fellow running blogger super generic girl sums this up nicely on her post. Rest of the week was pretty much attending the conference and doing work stuff. I managed to do some regular runs early in the morning in the nearby parks of St James, Hyde Park and along the Thames river. On a few occasions I had a few group runs with people from the conference also coming along. Hyde Park is a great place for running with so many options! I am at Heathrow airport about to board my flight back to NZ. I land on Saturday morning (It’s Thursday here and I lose Friday in the air). Sunday is the first Xterra Trail Run in Wellington! keep running!